The turn of the twentieth century and Cuba’s new independence spawned a push for modernity in domestic architecture, and Europe and especially North America were influential to the world-class Cuban school of architecture. Within the first decade of the twentieth century, the art nouveau style arrived from Europe with Catalan, Viennese, and French versions in overlapping succession. The numerous and very different decorative fa?ade treatments of Havana’s Palacio Cueto, built between 1905 and 1908, and the Guasch Palace in Pinar del R?o, built between 1909 and 1914, are perfect examples of the modernistic effect these styles produced. After the War of Independence and the Spanish- American War, .American companies began to invest hundreds of millions of dollars in major Cuban industries.The unprecedented fount of capital, popularly named the “dance of the millions” (danza de los millones), was responsible for a building boom that lasted from 1910 to 1930 and created new suburbs throughout all of Cuba. These foreign investments in mining, railroads, tobacco, coffee, utilities, and, most of all, in sugar also paid for time as one style came into fashion others that until lately had claimed that honor were still under construction. Cuban cities were becoming modernized and their architectural content was diversified. There were public and private offices and institutions, government buildings, bars, hotels, hospitals, social clubs, and commercial complexes, all designed, developed, and disseminated throughout the island. By the 1940s the modern architectural movement had shed all traditional reminiscences of the Mud?jar, Romanesque, gothic, and baroque influences Cuba had experienced, and another housing boom resulted from capital investment accumulated after World War II. Because of the technological advancement of reinforced concrete, apartment buildings started springing up in the late 1940s and through the next decade for the middle classes. Modernism came into its glory and peaked in the 1950s. Thousands of Cuban homes were designed in the contemporary fashion in the suburbs of towns and cities throughout the island. Houses in Havana’s Miramar and Cubanacán districts illustrate the last phase of Cuban modernism before the Communist Revolution. In the Miramar district Casa de Eutimio Falla Bonet was designed by architect Eugenio Batista and broke radically with the traditional grandeur and opulence of Havana’s elite. Constructed in 1939, the single-story modernity employs concepts that Batista developed to achieve a style influenced by traditional Cuban colonial architecture but defined by the latest modernism in aesthetic composition. The Cubanacán district was originally called Country Club Park and was Havana’s equivalent to Beverly Hills. First developed in the 1920s by Alberto Mendóza with winding tree-lined streets and enormous lots, the district housed the most ostentatious and grandiose mansions built by Havana’s wealthy classes. In the character of country estates, the United States ambassador’s residence was built in this area in 1939 in the twentieth-century neoclassical “garden city” style. Designed and built with a collaboration of American and Cuban architects and builders, the residence has a total of sixty-five rooms and covers more than 31,700 square feet of living space. The first-floor state dining room seats forty people. The second floor has seven bedrooms each with its own loggia from where the grounds can be viewed. The residence is surrounded by seventeen acres of beautiful formal gardens, with fountains, a swimming pool, tennis courts, and an orchard of fruit trees. At the end of a long promenade, overlooking a reflecting pool, is a huge American eagle sculpture. It once stood atop the Monumento del Maine on the Malecón, Havana’s ocean promenade. It was placed to commemorate the battleship Maine, blown up in Havana Harbor on February 15, 1898, killing 266 of the crew members—?the incident that ignited the Spanish-American War. Today, with the exception of the few ingenios and cafetales that have been made into government restaurants, all of Cuba’s once large sugar and coffee plantation great houses (haciendas) lie in ruins, destroyed during the wars of independence as part of the scorched-earth policy carried out by the Mambi (independent) army or by the reorganization of agricultural systems under the communist regime in the last half of the twentieth century. Most of the wealthy homeowners fled Cuba in the 1960s, and their country villas, palacios, and mansions were dispensed to government officials or their appointees who live in the lap of luxury behind closed doors and are unavailable for research or photography. By the 1960s, Cuba’s architectural revolution abruptly ended. Following the Communist Revolution, most of the leading architects left the island; in 1965 the School of Architecture closed, signifying the end of Cuba’s glorious era of architecture. 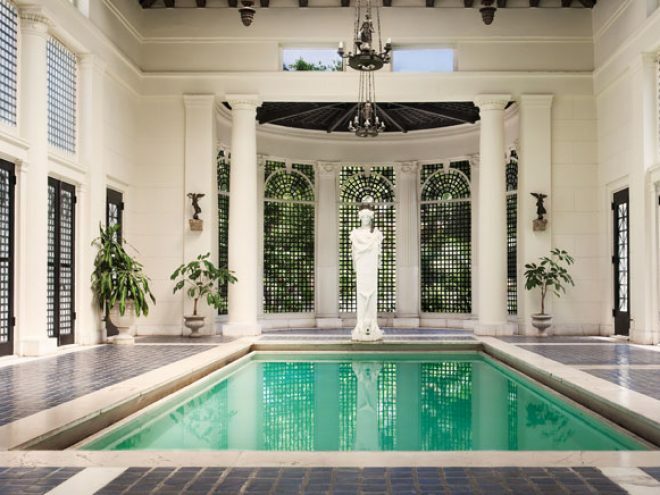 An unprecedented tour of stunning and architecturally significant Cuban palacios, mansions, and private homes that have been meticulously preserved, previously un-photographed, and inaccessible to visitors. At a time when more travelers are rediscovering Cuba, this lavishly illustrated volume offers a different view of the island’s cultural achievements. It presents not the picturesque Cuba of Castro’s era, with its derelict buildings and peeling paint, but the opulent world of the Spanish Creole aristocracy of the colonial period, with its Mudejar craftsmanship and baroque palacios, the sugarcane plantations (ingenios) and coffee plantations (cafetales), and classically inspired grand mansions. Exceptional preservation work has kept these villas in the magnificent state in which they were first envisioned. The photographs, shot exclusively for this book, show examples in each area of the island-from the interiors and exteriors in Havana, Santiago de Cuba, Santa Clara, Cienfuegos, and Pinar del Rio to close-up details of courtyards, balconies, galleries, balustrades, grilles, and louvered doors in Trinidad, Matanzas, and Holguin. One featured home is Finca Vigia (“lookout house”), the former residence of Ernest Hemingway.